Menu Courses: How Many Do You Need? As you can see in the attached video, the number of courses will often depend on the formality and time of day of your wedding. For example, a brunch or lunchtime wedding will have fewer courses than an evening event. You may also choose fewer courses if your wedding has a more casual theme. Speak with your caterers to determine the perfect menu and course choices. Family reunions are a great time to catch up and have fun with long-distance family. Planning a reunion for the first time, however, can be stressful. You can cut back on the stress by enlisting helpful family members to book the rental equipment and help set up your venue in Baltimore. Read on to learn some easy tips that will make planning your first family reunion a great experience. It is best to plan any sort of large get together with the help of others. If you are wrangling in family members from all over the country—and you need to set up lodging, food, and activities—then you need all of the help you can get. Enlist family members who get along and work well together. Designate tasks to each person and set up deadlines for each task to be completed. For example, any rental equipment, such as china or chair rentals, should be rented about two months prior to the reunion. Planning a family reunion requires a lot of time. If you are planning a large reunion, then start making reservations for lodging and travel six months to a year before the reunion date. Book a large estate, hotel rooms, or banquet hall a year in advance, because these locations are commonly reserved for large parties as soon as they become available. Notify all of the family once you have a specified date for the reunion. This will give your family members plenty of time to request time off work, make travel arrangements, and make other vacation plans. For your first time planning a family reunion, try to start as small as possible. Only invite close family members who do not get to see each other often. If you start too big, and invite extended cousins for example, then you risk becoming overwhelmed and the reunion falling apart. There are countless ways to decorate your cocktail bar area. Consider your wedding or event theme before choosing your rental equipment, because you may find some new ideas for your party rentals. For example, a regular wooden table rental in Annapolis can be spruced up with the addition of sand or table linens. You can create the perfect cocktail decorations using a variety of rentals available to you. Read on for some fun ideas to decorate your cocktail bar area. If your wedding or event has a rustic or country theme, then decorate your cocktail bar with wooden barrels, wagon wheels, and wooden fixtures. 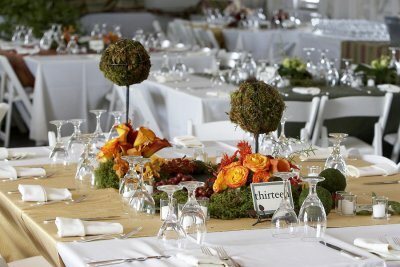 Rustic elegance is a popular party theme right now, and it can be easily accomplished with a few simple party rentals. For example, large barrels and repurposed wooden centerpieces will give your rustic cocktail hour the added flair it needs. Whether your wedding is on the beach or hundreds of miles away from the beach, you can bring the sand and waves to you. Set up a repurposed wooden shelf or table, and lay down heaps of white sand on the surface. Place seashells, starfish, and netting around the table for more beach vibes. Display signature cocktails and beers nestled in the sand with a cocktail umbrella shading them. Create an elegant and formal affair with a banquet décor around your cocktail bar. Drape fine table linens across the table. Set up tealight candles or candelabras on the table and around the bar area to create a soft glow and warm feeling. Place tall centerpieces on either side of the bar to properly frame it, and place large trees or drapes behind the bar for a more elegant look. Speakeasies are making a comeback in the bar scene, so why not include it in your wedding or special event? Your table and chair rentals should come in dark colors with cushioned seats. Choose dark woods for your bar table, and set up ferns to frame the bar. Wedding cakes and desserts are becoming more beautiful and more inventive every day. You can commission a hand-painted cake or display a variety of mixed desserts on your table rentals near Annapolis. Ensure that your wedding cake—like your party rentals , table linens, and rented china—represent you and your significant other by taking an active hand in its creation. Speak with your cake designer, party rental specialist, and wedding coordinator about the best ways to feature beautiful summer ideas for your summer wedding. 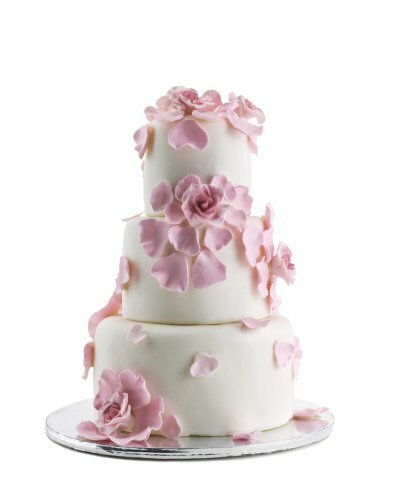 Get started by reading about different summer wedding cakes below. Painted wedding cakes are the rage right now, because they are hand-crafted pieces of art that can subtly represent you and your significant other. You can have your favorite summer flowers or your favorite summer vacation spot painted on the sides of the cake. Speak with your cake designer to determine how simple or intricate your cake painting can be. Geometric shapes are another popular wedding feature. This idea is especially good if you or your significant other likes math, engineering, or architecture. Your cake designer can decorate each shape with patterns of your wedding colors. If you do not like geometric shapes, then consider modern lines that are sleek and clean. 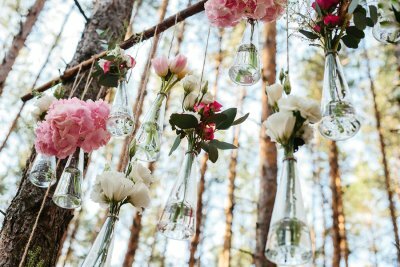 Continue this idea across your wedding decorating to create a cohesive theme. There are no rules that say you must serve wedding cake at your wedding. In fact, many people do not like traditional wedding cake. Serve a variety of desserts to please all of your guests. You can use different-sized serving platters to create an engaging and interesting-looking dessert table. Consider serving a small wedding cake, chocolate-covered fruit, and candies for a nice variety of sweets that your guests will love. Bundt cakes are another welcome change from traditional wedding cakes. You can serve different flavors and display them in flattering patterns around your dessert table. You can also decorate your Bundt cakes to match your wedding colors and the colors of summer. Toasting is a common feature at weddings, corporate events, and anniversary parties . Hosts are usually prepared with various party rentals in Annapolis—such as a microphone and audio rental equipment—but every guest may not be as prepared to deliver a toast. However, the attached video offers three easy tips to help anyone deliver a great toast. Read on for a better look. Keep the toast short, sweet, and concise. A toast should not be long-winded, so practice delivering a few simple anecdotes and speak from the heart. Be careful when adding humor into a toast. A humorous toast should not be offensive, degrading, or filled with bad language. Practice well before the event. In case there is no available audio rental equipment, then be prepared to project and enunciate so everyone can hear. Summer weddings can be beautiful for you and your guests, as long as you prepare for potentially hot weather and summer vacation schedules. In addition to your typical china and chair rentals, put tents and fans on your list of rental equipment near Annapolis . These items, plus the following do’s and don’ts, will help make your summer wedding a great success. Summer may look gorgeous, but it does not always feel comfortable. Heat and humidity can put a damper on your big day, so it is crucial to have various measures in place to beat the heat. Include several fans and misters on your list of rental equipment. Offer guests and members of the bridal party water and cold drinks throughout the event. These measures will help prevent overheated guests and ensure that everyone has a great time. In addition to beating the heat, it is important to prepare for all types of weather conditions. More likely, you will have to contend with the sun during the summer, but rainy weather is a possibility too. Consider renting a large tent or canopies to keep your guests and bridal party protected from the hot sun or rainy clouds. Summer is often the best time for families to take vacations, so it is necessary to inform your guests of your wedding date ahead of your invitations. When your guests receive their save-the-dates, they can better prepare their traveling plans. If they are coming from out of the town, then they may plan their vacation around your wedding. In-town guests can ensure they will be able to attend your wedding and plan their trips for another date. Preparing for the summer heat should also include wearing the proper attire. Ensure that the bridal party is outfitted in lighter attire, such as linen suits and short or tea-length dresses. Include suggestions for light attire on the invitations, so your guests will feel comfortable as well. If you are planning your first fundraising event, then you need as much help as you can get to make it a success. For example, use your budget on the rental equipment , such as nice table and chair rentals near Baltimore. Work closely with your staff to ensure the event is seamless. Also, do not forget to tell everyone about your big gala, so your charity can earn as much support as possible. Read on for more tips about organizing your first fundraising gala. Establishing a budget should be one of the first items on your fundraising event to-do list. You cannot effectively plan the event without a budget in mind. Once you have an overall dollar amount, then you can separate the budget by important details. For example, a significant portion of your budget will go toward a venue and rental equipment, such as audio-visual equipment and a stage rental. Another part of your budget should go toward catering details, decorations, and marketing your event. In the days leading up to your fundraising gala, speak with your event staff about the plan for the event. Your staff should know the timeline of when food will be served, guests will speak, and other festivities will begin. If you have any expectations of your event staff—such as their involvement in promoting the charity—then make them known before the event. Remain in contact with your event staff throughout the event, or put a trusted individual in charge to act as your proxy. Ensure that your fundraising gala is well-marketed in the months, weeks, and days leading to the event. Send out email reminders to your guests, and post details about the event and your charity with all of your vendors. During the event, place fliers about the charity next to your serving platters and on guests’ tables. This will help reinforce the reason that your guests are attending this fundraising gala. Renting glassware in Annapolis is an excellent way to impress your holiday party guests. But before you can select the right type of glassware for your holiday party, you’ll need to decide which type of drinks you’ll be serving. Along with selecting the right rental equipment, you may wish to hire a bartender. Ask him or her about serving drinks like Ginger Fever, New Year’s Eve Sparkler, or the Tom Collins. Reverse martinis are another elegant choice for any holiday party. Watch this video for a demonstration of mixing these popular drinks. The New Year’s Eve Sparkler, for example, typically contains pomegranate juice, vodka, and champagne. When you watch this video, you’ll also see some elegant rental equipment to consider for your party, including different types of glassware. Getting ready to tie the knot involves many decisions and plenty of planning, and one choice you’ll encounter is that of the reception type. If you’re in the process of organizing your wedding rentals in Baltimore, then read on to learn about some of your reception options. If you’re not looking forward to mingling and dealing with crowds after your wedding, then you should consider arranging for a champagne and cake reception. These events are inexpensive and short-lived, allowing just enough time for enjoying the dessert and sharing a few toasts. Are you having an early morning wedding? If so, then a brunch reception could be the right option for you. These receptions allow newlyweds to get an earlier start on their honeymoon travels. Also, they can be less expensive than other events because you won’t need rental equipment for things like glassware and table linens, plus people tend to drink less alcohol at this hour. However, do consider including mimosas and Bellinis in your menu options. If formal and classic describe the theme of your wedding, then a traditional dinner reception could be the best type of reception for your needs. While sit-down dinners tend to be the most expensive type of reception, they do boast elegance and let your guests know that you went all-out for the occasion. If you want to provide your guests with dinner but are working within a tighter budget than a sit-down meal will allow, then consider renting equipment for a buffet-style reception. This option can cost significantly less since it requires fewer servers, and it can also provide your guests with a broader range of choices. 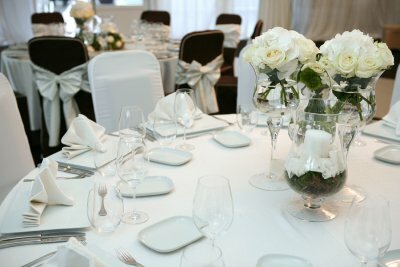 If you want a relaxed and party-like atmosphere after the wedding ceremony, then consider hosting a cocktail reception. These events tend to feel less formal than a sit-down dinner, but can still be stylish and elegant. This type of reception works well for small venues, is great for encouraging mingling, and tend to run shorter than other reception options. When planning a holiday party, the first step that you should take is to set a date that is unlikely to conflict with holiday travel plans and other events. Next, create a guest list and send out invitations that include a date by which the attendees should R.S.V.P. Once you know approximately how many guests you can expect, you can move on to finding a suitable party venue. At this time of year, it’s important to consider the weather when you’re party planning. Ideally, choose a location that can hold everyone indoors, but that also has an outdoor area. Finally, consider getting outdoor space heaters from a party rental company to allow your guests to remain more comfortable when outside. Holidays parties provide you with an excellent opportunity to have fun with décor and create a festive atmosphere that your guests will remember. Decide on a few colors that will dominate the decorations, as well as a party theme around which you can base your choices for equipment and décor rentals. Do you want to create a winter wonderland, a traditional holiday at home, a stylish and elegant evening, or an event packed with fun and activities? When getting ready for a holiday party, consider what type of seating you would like and how you plan to serve the food. Many people favor the use of buffets for events like these because they give people a better chance to mingle, which can be more difficult when guests are confined to their seats. Finally, think about what glassware, flatware, table linen, table, and chair rentals you will need to make the party a success. Following these tips, you can get ready for a party that your guests are sure to enjoy.